Seagate has announced its first helium-filled large-capacity hard disk drives, which are primarily designed for datacenters and other enterprise applications. The largest drive in Seagate's helium line-up has a capacity of 10 TB, matching HGST's competing line that was announced last month. Like HGST's drive, Seagate's 10 TB helium-filled drive uses seven platters, each with a 1.43 TB capacity, as well as 14 heads. There was no need to use alternative platter technologies like shingled magnetic recording (SMR) to achieve such a large capacity, with Seagate also opting to use traditional perpendicular magnetic recording (PMR) for this drive. 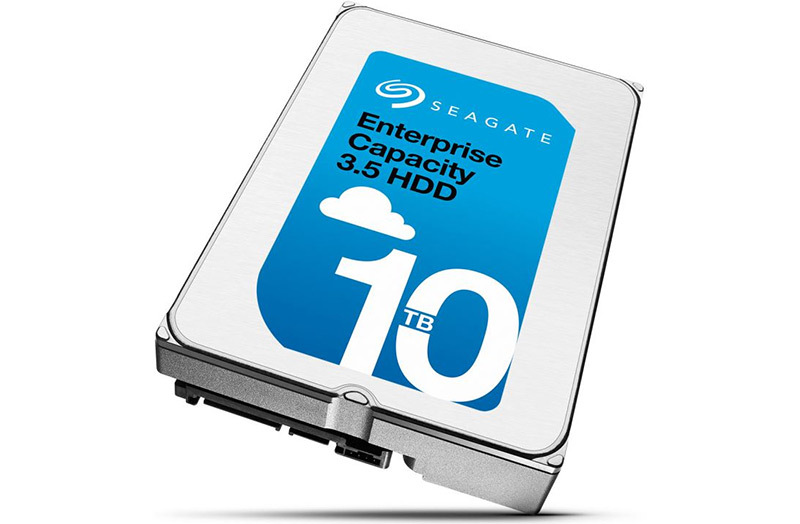 The 10 TB Seagate Enterprise Capacity drive comes in a 3.5-inch form factor, and supports either SATA 6 Gbps or SAS 12 Gbps interfaces. Seagate claims this drive has a 2.5 million hour MTBF, as well as the lowest power-per-terabyte ratio at this capacity, although the company didn't release a complete spec sheet. Alongside the announcement of a 10 TB helium-filled drive, which is shipping to select customers now without an announced price, Seagate has added an 8 TB hard drive to its NAS line-up. Seagate says this new drive is the "largest NAS-optimized drive on the market", while also claiming the HDD's firmware is optimized with "extended error recovery controls." Like the 10 TB enterprise drive, the new 8 TB NAS drive is shipping to select customers now, and is expected to hit the wider market by the end of Q1 2016.